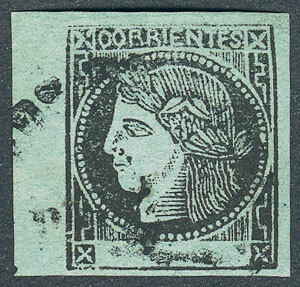 GJ.5, 1865 bluish green, type 1, with rimless datestamp of Corrientes, VF quality, catalog value US$200. Lot 89 - Argentina PROVINCE OF CORRIENTES - Guillermo Jalil - Philatino Auction # 1911 WORLDWIDE + ARGENTINA: General March auction! Lot 87 - Argentina corrientes - Guillermo Jalil - Philatino Auction # 1911 WORLDWIDE + ARGENTINA: General March auction! Lot 90 - Argentina PROVINCE OF CORRIENTES - Guillermo Jalil - Philatino Auction # 1911 WORLDWIDE + ARGENTINA: General March auction!